Just to keep focus and ensure that I'm on the track towards my application for my first DTM award, I'm writing this post. 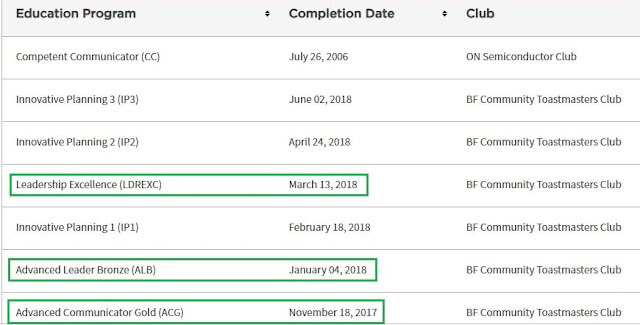 I've documented the checklist towards my DTM in the legacy program and ticked off marks on those requirements that were completed. I've added as well the supporting documentation or references. Shown below is a section of the back page of the Advanced Leader/ Distinguished Toastmaster Awards Application Form. 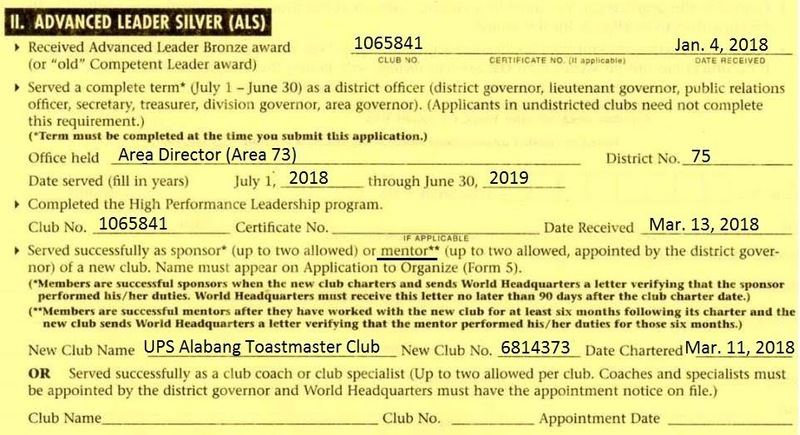 The back page shows the application sections for the ALS (Advanced Leader Silver) norm which is a prerequisite for the DTM (Distinguished Toastmaster) norm. The Club Number and Chartered Date of the Club Mentor award for the UPS TMC was taken from the Mentor Award I received recently. I filled out the applicable blanks on the form as shown above so I won't have to dig around old records when the time comes that I will be submitting the paper form to our VP-Ed. I'll just copy the details and put on the paper form. Shown below is a partial list of the Education Awards I received. This Education Awards report may be accessed from the Profile in the main page of the TI website. I boxed in green, the relevant awards and dates completed that were used for filling-up the ALS application. The High Performance Leadership (HPL) Award date is March 13, 2018. This is the same date shown on the High Performance Leadership Certificate. 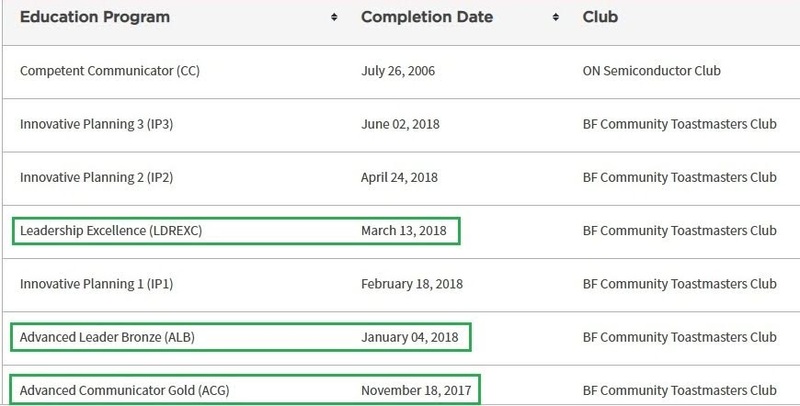 Note the date for the ACG award will be put into the blank for the DTM application as shown below. For the DTM application, I need to receive the ALS award first. Essentially the ALS and the ACG awards are the requirements for the DTM norm in the legacy version of the Toastmasters Education Program.